As promised in my Mark Knopfler review I've also revied the Nightwish album. Their latest creation is called Dark Passion Play. I really like the album cover, and the whole artwork of the CD. The CDs are lined with a tribal decoration. As with Mark's Kill to get crimson, I bought the special edition :-). This one contains another CD with instrumental versions of all the songs. 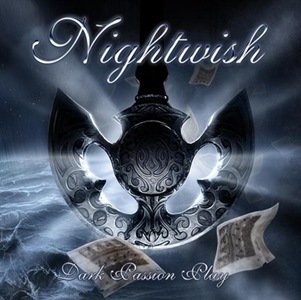 This is an interesting idea and one that proves that Nightwish is a symphonic metal band. In fact, all of the thirteen songs rely heavily on the melody and instruments. Most of them have some addition of an orchestra in them. My favorite song on the album is Cadence of her last breath. It's one song where Anette's vocals just may be powerfull enough. So, basically, to me, it's a 5/5. I like the album, I like the songs. I can hardly wait to see them live next year (4.3.2008!). I missed them last time, and I regret that.